The Australia-New Zealand Food Regulation Ministerial Council has requested Food Standards Australia to consider putting warnings on all alcoholic drinks. 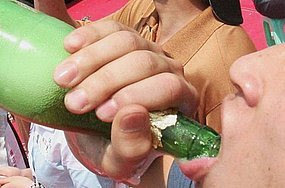 PHA chief executive Michael Moore says mandatory warnings are a must if Australia is to properly combat binge drinking. "I think people should be warned about intoxication," he said. "I think they should be reminded that drinking sensibly is one thing but drinking to get drunk is an inappropriate way to use alcohol and an unhealthy way to use alcohol." Mr Moore says warnings must carry the basic message that getting drunk is unhealthy. "I think that it is appropriate if we begin a labelling regime to apply to alcohol across the board," he said. "I think it is appropriate to remind people that what we ought to be doing is drinking sensible and binge drinking or drinking regularly is really not good for your health." Three men have been arrested over a stabbing in Sydney's Darling Harbour, after police had to respond to three separate fights involving up to 30 people. A 24-year-old man was taken to Royal Prince Alfred Hospital, Camperdown, after being stabbed in the back during one brawl, which occurred at a hotel on Wheat Road. Police say they were called to the hotel around 1.30am (AEST), with reports that three separate fights had broken out involving 30 people. Three men were later arrested over the incident. Two 18-year-olds and one 19-year-old have been taken to City Central police station, where the are currently being questioned, police said. Meanwhile, two teenage boys have been charged after a separate altercation in Sydney's Hyde Park last night. Police say a group of 15 teenagers had gathered at the park, before a fight broke out among the youths at 1.30am (AEST). A 19-year-old Croydon Park man and 17-year-old from Burwood Heights were arrested by police patrolling the park. Both have been charged with affray and will appear in court later this month. The 19-year old will appear at Downing Centre Local Court on May 23, while the teenager will face Bidura Children's Court the same day. Many of those involved in the accident were from Balmain. Friends gathered, embraced and cried openly on Darling Street, and soon after were intoxicated with alcohol as well as grief. Balmain bar staff described the incident as a pub staff night gone wrong. The Commercial Hotel on Darling Street had changed hands on Wednesday and it is understood that staff from hotels in the area had gathered to mark the occasion with a night of drinking and celebration.